Anywhere between 10,000 and 50,000 people currently live on Moscow’s streets. Unfortunately, this figure is not on the decline. Russia in the 1990s was the site of mass homelessness: At the time, drastic changes in the country put hundreds of thousands of Russians out on the street. Today, although the economic situation has improved, sociologists count between 1.5 and 3 million homeless people. Experts believe that returning people to a civilized existence is possible if they have not been living on the streets for a long time. Yuri is someone whose life on the streets started more than 15 years ago. Now 45 years old, he spent his first night on the street when he was 29. There was a time when he lived in his parents’ apartment in Moscow and worked as a salesperson in a store. However, after his parents died, his sister sold their apartment and evicted him. “I entrusted the sale of my parents’ apartment to my sister. I got only a small portion. I raised a scandal, fought with her and threatened to kill her — but then I decided, OK, to hell with her. I’ll get by. I didn’t have a lot of money. I rented a small apartment and was on my own,” Yuri says. However, his parents’ death, the feud with his sister and the new situation knocked him down, and then there were more troubles ahead — alcohol, debts, quarrels with friends. It got to the point where he no longer had rent money; for the first time in his life, he had to sleep in a doorway. This happened in the late 1990s. 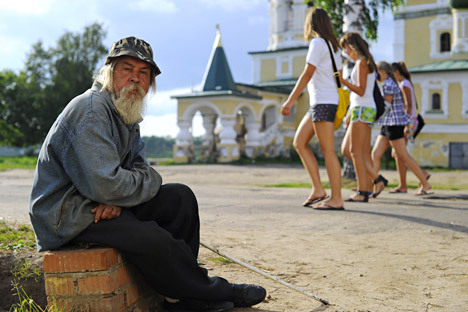 Today, Yuri sleeps at the Kursk train station, spending his days panhandling next to churches. He says that, to live, he can make do on 500‒800 rubles ($15–20) per day. His social circle consists of other homeless people. They frequently gather together to buy food and alcohol and look for places to sleep. Yuri has become used to life on the street, and he says that he is unlikely to be able to return to the mainstream world. Svetlana, a 50-something woman dressed in a worn-out polyester jacket and old sneakers, says that she came from Ukraine to Moscow to earn money, having been promised a job there. Everything crumpled for Svetlana when she arrived in Moscow and the job did not materialize. She fell in with gypsies, who held her captive and forced her to panhandle in the metro. Fortunately, she managed to escape, but she did not want to go home after that. Now, Svetlana makes her bed in one of Moscow’s courtyards, which she shares with two other homeless people. She is on excellent terms with all the local poverty-stricken people; indeed, only they genuinely understand her. “We’re like a big family, where everyone helps one another survive,” she says. Svetlana says that she would agree to take any job, as long as it pays. The problem is that she has no papers, since they were taken when she was working with the gypsies; in any case, they were Ukrainian papers. The only way back to a normal life — going to Ukraine — is not one she is considering. In theory, Svetlana does not like to speculate about the future. For her, there is only the here and now, even though she sometimes worries about the cold: Surviving this winter is the main concern. Depending on the source of information, between 10,000 and 50,000 people currently live on Moscow’s streets. Unfortunately, this figure is not on the decline. According to Elena Kovalenko, project manager at the Institute for Urban Economics, the main problems that crop up on the path to overcoming homelessness stem from the government’s ineffective social policies and the mentality of the homeless themselves. “Homelessness is not a sudden blow, but generally a gradual process of an accumulation of problems that markedly constrict a person’s abilities to manage the situation. Let’s say that a person could live without a registered home for a long time and not think about homelessness; then, as a result of an unlucky incident, he falls ill, and then, because of that, loses his job and the means to rent an apartment. The people who end up in such situations and the paths that brought them there vary greatly, yet others automatically call [these people] homeless,” Kovalenko says. “Government services do not focus on precautionary or preventive measures, while the social work with those who have already become homeless is complicated by bureaucratic obstacles, a low level of cooperation between separate services, insufficient development of the network of specialized agencies, and so on. The social services options are designed for more-or-less socially adapted people, and those who have just ended up on the streets often don’t know about these services or have a distorted idea about them,” says the urban economics expert. Valentina Surkova of Moscow is sure that it is possible to help people — the main thing is to want to. She expends all her strength and pension on the homeless. She goes to the train stations and distributes vouchers inviting people to free lunches at her home. Surkova says that people can always share something they do not need and that other people really need — from food to old office equipment.